Quick Tip – Is that Dutch Name Male or Female? If you’re not Dutch, you may wonder if a first name is male or female. You can consult the First Name Database to search for the name. It will give you statistics on how many men (“m”) and women (“v”) had that name in the past 100 years. You can see a graph that shows the popularity of the name over time. You can even click “verspreiding” to see the provinces where the name is most popular. 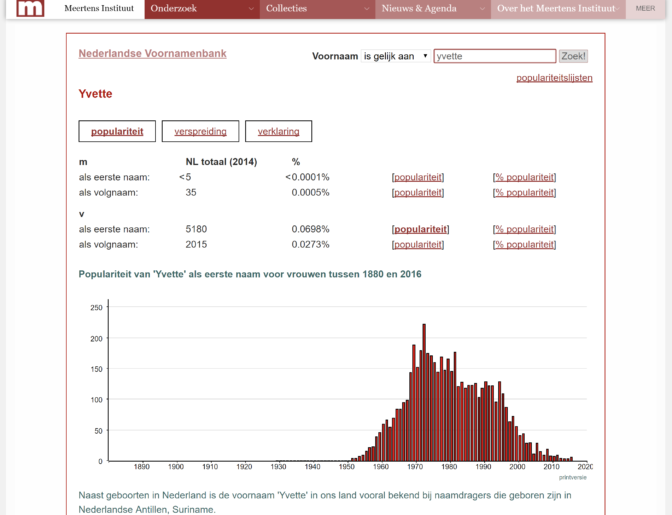 Yvette is predominantly a female name, which was the most popular in the 1970s. When a name ends with “je” or “ie” it’s female. For example: Jan (male) – Jannigje / Jannetje (female). Pieter (male) – Pietje (female). Teunis (male) – Teuntje (female). Willem (male) – Willempje (female). Ending with an ‘a’ can be a clue, too. For example: Cornelis (male) – Cornelia / Neeltje (female). Anthonie / Anthonis (male) – Anthonia (female). Wilhelmus (male) – Willemina / Willemijntje (female). Gerrit (male) – Gerdina (female). Adrianus / Adriaan / Arie (male) – Adriana / Adriaantje (female). Hendrik (male) – Hendrika / Hendrina (female). Original name spelled Vosburgh, the h was dropped around 1900. The farthest back we have records of is 1761 birth of great grandfather Isaac Vosburgh in New York, US. Served in Revolutionary war.